A ceiling fan is a stylish and functional addition to any room. If you are planning to install a ceiling fan in a room that already has a ceiling outlet, wiring a ceiling fan is the same as wiring any ceiling fixture. If the room doesn’t have an overhead box, hire an electrician to install the box and fish the wires through the walls and across the ceiling. Save the fun of installing the actual fan for yourself. If you can access the ceiling on which you want to attach the fan from the attic or from an overhead area, you have several choices in the type of box you install. 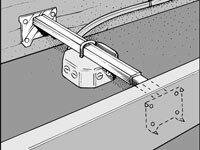 If you can’t get to the area above the box, you have to use an adjustable hanger bar designed for installation through the hole left by the existing ceiling box. 1Turn off the power at the fuse or circuit panel. You may find several pairs of wires in the ceiling box. Some may be wired to circuits other than the one that the fixture you’re working on uses. Be safe: Use a circuit tester or turn off the power to the whole house before attempting to install a ceiling fan. That’s the only way to be sure that all wires in the box are dead. 2Remove any light bulb cover and bulbs from the fixture and then unscrew the screws or nuts holding the fixture base to the ceiling box. Because ceiling fans are so heavy, the National Electrical Code (NEC) prohibits attaching a ceiling fan to a standard ceiling box. Before you purchase the fan, check the manufacturer’s installation instructions and purchase an approved electrical ceiling box. 3Lower the fixture base and remove the electrical tape or wire nuts. The wires come in two or three colors: black (hot), white (neutral), and, if present, green (ground) wires. 4Disconnect the wires to the existing ceiling box and remove it. First, loosen the cable clamp screw that secures the incoming cable to the box. Then remove the box, working from above, if possible. Otherwise, remove any accessible fasteners (nails or screws) that attach it to the framing or push it up into the cavity to pry it from the framing or bend its hanger bar, depending on how it is attached. 5Follow the manufacturer's directions to install the adjustable hanger bar and ceiling box. You install most hanger bars by pushing them through the hole in the ceiling left by the old electrical box. 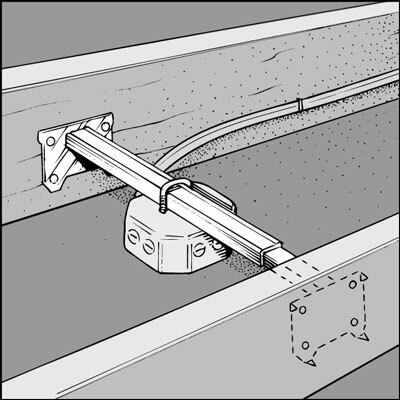 When you have the hanger bar completely through the hole, rotate it until it’s perpendicular to the ceiling joists. The bar expands until it engages the ceiling joists. The ends of the hanger bar are equipped with sharp steel pins that dig into the wood joists when the hanger bar is expanded. You then attach the special ceiling box to the hanger bar, locking it in place to provide a secure base for the fan. 6Assemble the fan according to the manufacturer's instructions. 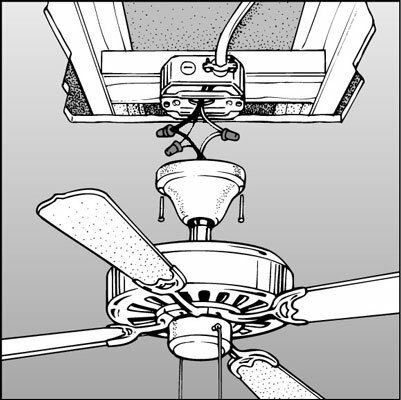 Ceiling fans are heavy, so they require support while you attach the wires. Most models provide a way for you to suspend them below the ceiling box while you attach the wires. If yours doesn’t, get a helper to support the fan assembly while you attach the wires. 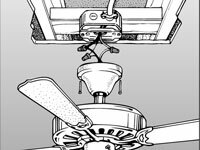 Wiring schemes differ slightly from fan to fan, depending on whether they’re equipped with a light or speed control. The basic installation of a ceiling fan is no different from that of a standard light fixture. Use wire nuts to attach the fan’s black or colored wire and white wire to matching wires in the ceiling box. If the wiring has a green ground wire, attach it to the green or bare wire in the box. 7Complete the attachment of the fan assembly to the ceiling box. This should just involve a few screws. 8Install the trim and fan blades according to the manufacturer's directions. Turn on the power and test the installation.